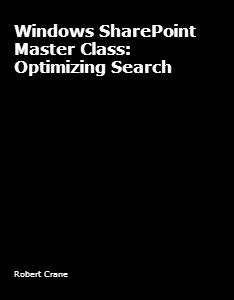 This book is designed for those that want to take Windows SharePoint Services v 3.0 Search beyond the default. Did you know that Windows SharePoint Services v3.0 could index the contents of Adobe Acrobat documents and TIFF files? It normally can’t do either of these by default but the information inside this book will show you how to that and more. You’ll learn how to configure Search Server Express 2008 (free from Microsoft) to index information beyond SharePoint sites including Exchange Public folders, web sites and network shares. Implemented correctly Search Server Express can provide you the power of an internal search engine allowing you to make better and faster use of your digital information. If you want to make the most of Windows SharePoint Services then this book is for you.